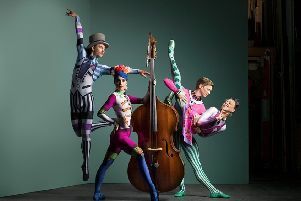 SPECTRA returns to the city for a fifth year – inviting audiences to ‘Play the Night’ and featuring a unique music programme. Aberdeen City Council’s annual light festival SPECTRA will once again brighten up the winter nights, encouraging audiences to get out and experience the city at its best when interactive sculptures, architectural projections and experimental music create new ways of exploring the urban landscape. SPECTRA’s first live music programme, delivered through partners the True North Festival, was successfully introduced in 2017. This year, the music element goes beyond a live stage and will feature an outstanding music programme, supported by Event Scotland, played out at venues across the city by a smorgasbord of Nordic and UK talent – culminating in stunning AV shows from stars of electronic music. Stuart Turner, head of Event Scotland, said: “Since its inception in 2014, SPECTRA has quickly grown to become a major event in Scotland, bringing a spark of inspiration to the winter months in the North-east. The SPECTRA Music programme kicks off at The Assembly on Thursday, February 8, with an eclectic mix of UK and international names – from up and coming indie-electronic act Cymbals, followed by avant-garde Icelandic Jazz outfit ADHD, and finishing off with the hauntingly beautiful Mt. Wolf. On Friday, February 9, the weekend steps up with Reykjavik Grapevine 2016 album of the year winner Tonik Ensemble, followed by the addictive minimalist techno of Faroe Islands duo Orka. Wrangler, with Cabaret Voltaire’s Stephen Mallinder fronting the electronic supergroup, will close The Assembly with a show combining stunning visuals and irreverent lyricism. Friday’s late programming takes audiences over to Tunnels to see emerging Scandi-influenced pop songstress Bruch, followed by legendary synth techno producer Mental Overdrive, hailing from the city of Trømso in Norway and an integral member of the scene that spawned Royksopp, Bjorn Torske and many more seminal acts. The programme for Saturday, February 10, kicks-off with psychedelic electronica-infused rock trio Nányë, followed by celebrated Icelandic Mammút act. Finishing the Saturday programme at The Assembly will be the superb Hidden Orchestra, with a visually stunning AV show. Late programming spreads into Tunnels and Unit 51 with Scotland’s own Emma Pollock and hauntingly deep blues act Seafoam Green at Tunnels. Producers and DJs Cler Lever and James Orvis will take the stage, playing heavy, progressive, melodic and deep house and techno in Unit 51. The final night of music on Sunday, February 11, sees The Assembly come alive to a raft of electronic treats from Icelandic trio Sykur, London-based duo Wyles & Simpson and Warp Records legends Plaid – unveiling an all new AV projection show. Following on to the late programming at Tunnels and Unit 51, indie-rocker Emilio Pinchi and vaudeville dream pop 8 piece Science of the Lamps will be live in Tunnels. Unit 51 will host two pioneers of their respective fields, as Steve Cobby plays a DJ set before the headline act of the weekend Lindstrøm take over.